Erie is a city on Lake Erie in Erie County, Pennsylvania. Eerie coincidence? Photo credit: City of Erie. Erie is the fourth-largest city in Pennsylvania, with a population of just under 100,000. It’s situated halfway between Buffalo, New York and Cleveland, Ohio. Erie’s manufacturing sector remains prominent in the local economy, although health care, higher education, technology, service industries, and tourism are all emerging to diversify their economic base. Over four million people visit Erie during summer months for recreation at Presque Isle State Park. Now, in October of 2017, Gannon University announced their $2.5 million investment in downtown Erie, specifically to the Erie Downtown Development Corporation (EDDC). The university’s trustees are “all in” on the EDDC’s plans to spur economic development by revitalizing Erie’s core, says university President Keith Taylor, who is a member of EDDC’s advisory board. Erie started as a ship builder’s paradise, and has grown into a town that still offers slices of heaven. Locals and tourists alike love the protective bay and peninsula that made it ideal for ship builders – though today it primarily serves outdoor enthusiasts beach partiers. Pennsylvania’s only port city on the Great Lakes, Erie has a rich history in arts and culture, as well as generosity and resiliency. With a sturdy foundation, Erie leaders feel the city is primed to realize its maximum potential. Many private residents, companies and organizations have recently stepped up to build that potential. More than $600 million was committed to improving the city in 2016 alone. While having the resources to develop Erie’s assets is critical, so is that collaboration. The newly founded EDDC, a privately funded nonprofit led by a group of business and community leaders, is working towards transformational change. The EDDC’s core mission is to fuel economic growth through real estate development in downtown Erie. The objective is to fuel Erie’s overall revitalization. EDDC plans to develop real estate to increase the tax base and potential for mixed-income housing retail, dining and arts and culture to flourish. 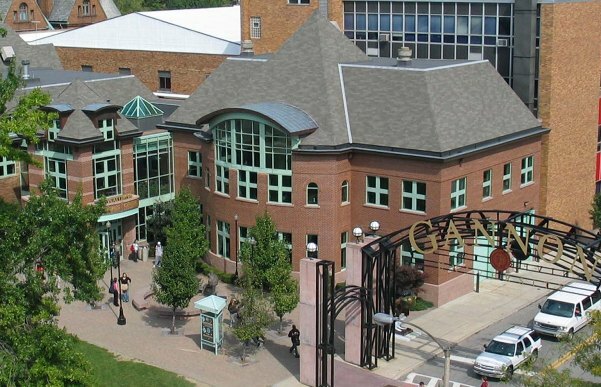 Gannon is a Catholic, Diocesan university dedicated to excellence in teaching, scholarship and service. Their faculty and staff prepare students to be global citizens through programs grounded in the liberal arts and sciences and professional specializations. In contrast to the fact-free, anti-science trend among many modern fundamentalists (of all faiths), Gannon is inspired by the Catholic Intellectual Tradition. They offer a comprehensive, values-centered learning experience that emphasizes faith, leadership, inclusiveness and social responsibility. Featured photo courtesy of Erie Downtown Development Corporation. See full article by Valerie Myers in GoErie. See Erie Downtown Development Corporation website. Want to attract private funding for urban infrastructure renewal? Embed high-tech.